The name Estero is Spanish for estuary – where the river meets the sea – and until the 1970’s much of the settlement and development in Estero was near the Estero River, then called Estero Creek. In the early days, Estero was a major citrus producing area. The first homesteader is reported to be Gustave Damkohler who in 1882 farmed citrus along the Estero River and then used the river to ship his harvests north via the Gulf of Mexico. Estero’s most noted pioneer was Cyrus Teed, leader of the Koreshan Unity which believed the universe existed within a giant hollow sphere. He and some of his followers began settling along the Estero River in 1894. Gustave Damkohler joined the group and donated his 320 acres of land to the Unity. The Koreshans were able to incorporate 110 square miles into the Town of Estero in 1904. The municipality stretched from a mile north of today’s Gladiolus Drive in south Fort Myers to a mile north of Bonita Beach Road in Bonita Springs and included all of today’s Lovers Key State Park and the Town of Fort Myers Beach. The Town of Estero was later abolished in 1907. During this time, the Koreshans opened a post office, store, blacksmith and saw mill; established schools for all those who wanted to attend; built an Art Hall for their symphony orchestra and theater group, and gathered exotic vegetation from throughout the world which they planted on their grounds. 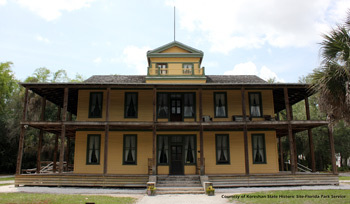 Eleven remaining historic structures are being maintained at the Koreshan State Historic Site. Not all the homesteaders of that time were happy with the Koreshans. In 1901 Mr. and Mrs. F. M. Hendry deeded land for the Estero Creek School with the restriction of prohibiting all things Koreshan. This school operated until 1903; there is no record of why it closed. A second, one-room Estero Creek School opened in 1904 and functioned until 1927, with the exception of a one-year closure due to the 1910 hurricane. The school now sits at the Estero Community Park next to a restored 1902 house which was first owned by Frank Hall, trustee of the school. In 1921, a new four-room school with indoor plumbing and Mediterranean Revival styling was built to accommodate 100 students. Called the Broadway Estero School, it operated until 1949 and still sits next to the old post office on Broadway. Fast forward to 2001-02…Estero had become the epicenter of growth. This is when Don Eslick, Neal Noethlich and a number of others decided to form the Estero Council of Community Leaders (ECCL) to address residents’ concerns and suggestions for how the community should continue to grow. 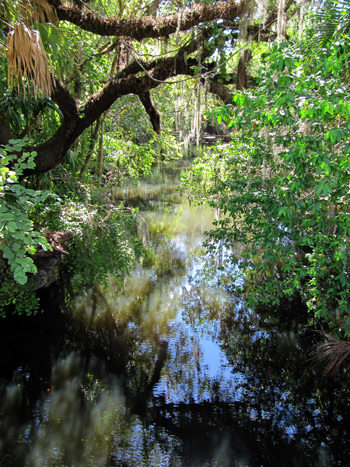 The ECCL, the Estero Community Planning Panel and Estero Design Review Committee established the architectural and landscaping guidelines which define Estero today. The attractive buildings and landscaping encompassing Coconut Point Mall, Lowes and Walmart are all prime examples of Estero’s high development standards. In July 2013, the ECCL, then chaired by Nick Batos, initiated incorporation efforts. Thirty-three community meetings were completed, Rep. Ray Rodrigues hosted two Town Hall meetings attended by over 3,000 Estero residents, and 10,238 petitions were signed by residents indicating their wish to have an incorporation referendum on the ballot. On December 3, 2013, the Lee County Legislative Delegation approved Rep. Ray Rodrigues’ local bill for an Estero incorporation referendum on the November 4, 2014, ballot. A resounding 86 percent of the Estero residents voted for incorporation which resulted in the 20 square mile community officially becoming the Village of Estero on December 31, 2014. On March 17, 2015, Batos was elected the Village’s first mayor. February 2, 2015: Deadline to register to vote in the Village of Estero election held March 3. February 2-7, 2015: Ballot by Mail forms will be mailed to registered voters. Ballots will not be forwarded. February 25-28, 2015: 10 a.m. – 6 p.m. Early Voting for Village of Estero Council Candidates, Estero Recreation Center, 9200 Corkscrew Palms Blvd.